It is made up of 12 ounce stonewashed canvas material. This bag is designed on the basis of classic vintage style. The main compartment of this bag comes with a zipper closure. 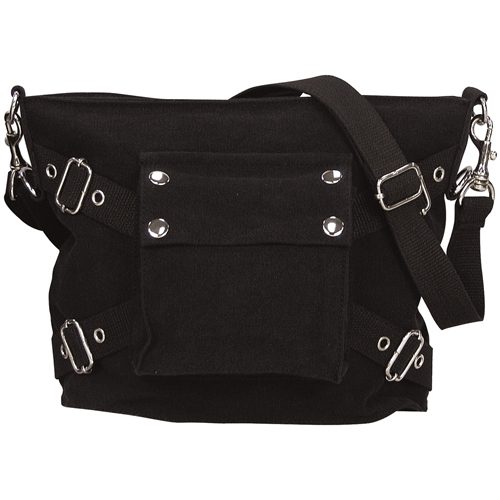 This shoulder bag comes in black color. It features a shoulder strap as well as a front packet with snap closure. The shoulder strap can be either adjusted or detached as per your wish. It also has two black colored metal buckle belts with loops which comes through the back portion of the bag and stretches into the front. It is lighter and smaller than the paratrooper bags. It can be conveniently worn on your shoulder.